Check the symptom based on the information obtained from the customer. Check if any other malfunctions are present. Connect CONSULT and perform self-diagnosis. Refer to MWI-26, "DTC Index". Are self-diagnosis results normal? YES >> GO TO 4. Perform symptom diagnosis and narrow down the malfunctioning parts. Repair or replace malfunctioning parts. If DTC is displayed, erase DTC after repairing or replacing malfunctioning parts. Check that the warning buzzer in the combination meter operates normally. Does it operate normally? 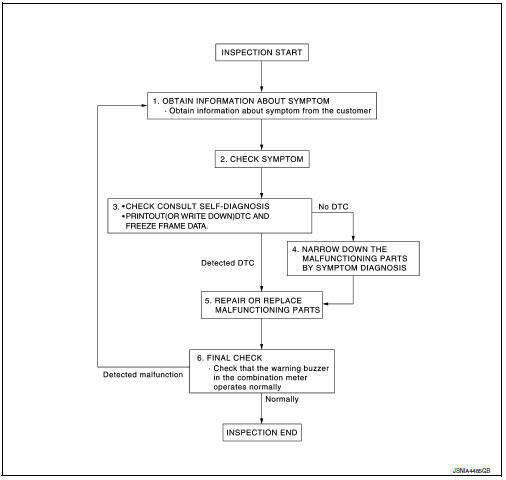 YES >> Inspection End.